The main operation in the woodworking industry is sawing. And one of the best tools for such a task is a circular saw. If you use a jigsaw, then, like many other home craftsmen, you can mistakenly assume that it is more versatile and easy to use. This, of course, is true, but a circular saw is better suited for creating straight cuts. And to work as safe, productive and high-quality, you need to know about the design features of this tool and the rules for its use. The circular saw is used to create straight cuts for various materials. The design of all models of the amateur and semi-professional level is almost the same. Dear professional units are equipped with additional elements and functions, but if you do not plan to open your sawmill, you will not need such a tool. 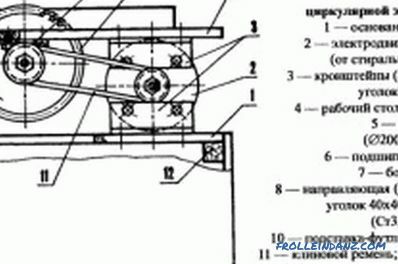 The design of the circular saw. 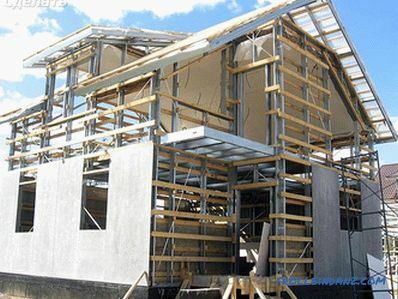 One of the main structural elements is the base plate. The instrument is attached directly to it. Despite its apparent simplicity, this element is very important. The base plate can be made of aluminum alloy and stamping. Stamping is cheaper. Such a plate is quite strong, but any more or less strong mechanical effects, even the usual fall, lead to the deformation of the product. And it is impossible to get a high-quality cut from a saw with a deformed base plate. Yes, and straighten it yourself you are unlikely to succeed. Stampings have lower stiffness than their cast counterparts. Therefore, if you have sufficient budget, it is better to buy a plate with a cast support. The only drawback of such products is that they can crack when dropped. However, it all depends on the care and responsibility of the user. The base plates of almost all saws are equipped with a mount for the stop. Thanks to this element, relatively accurate parallel cuts are possible. Practically all modern models are completed with a parallel emphasis. Such an emphasis is fastened in front, but there are also such models that allow it to be fastened both behind and in front. If you have to cut very delicate materials, then you must wear a special nozzle on the sole of the base plate. Usually such nozzles are included by the manufacturer in the kit. For professional models, the base plates are equipped with a special groove, allowing you to work with the guide rail. With this element you can achieve the highest possible accuracy. However, the guides are usually not included, they have to be bought separately. Circular saws are equipped with many different elements and additional functions. For example, quite often on instruments there is an additional handle. Talking about her appointment does not make sense - it makes working with the tool more convenient. The only thing that needs to be noted, this element happens 2 types. The most convenient, according to user feedback, is the handle mounted on the saw platform. Most often tools are completed with an additional handle in the form of a fungus. The circular saw is necessarily equipped with a protective casing. This element consists of two parts. The lower one is mobile, the upper one is fixed. In the upper part there is a special hole through which sawdust is removed during work. The hole may have a different shape. If you do not connect a vacuum cleaner to your saw, then you may not pay attention to the shape of the hole. If the vacuum cleaner is connected, it is better to choose a tool with a round hole, otherwise you will have to additionally look for a special adapter. Circular saws must be equipped with a riving knife. It is designed so that the disk does not pinch in the process. This element is fastened with a pair of bolts. To make it easier to install and clean, in the upper casing of the saw there is a special hole. But there are models without such a hole. In such a situation, in order to gain access to the anchorages, the saw must be installed in a position that corresponds to zero kerf. To dismantle the knife has quite rarely. Usually the need for this arises when the workpiece has to be cut from the middle and not from the edge. It is important to be able to work with the tool's start button. At circular saws, it is not quite simple. This button is associated with a protective mechanism that eliminates the risk of accidentally turning on the saw. That is, you will not be able to click on this button until you press the unlock button. 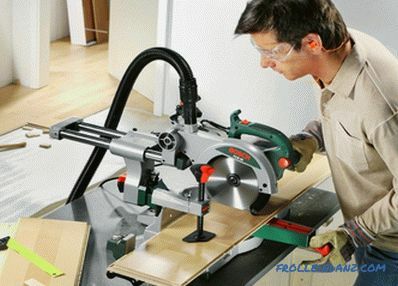 With this solution, circular saw becomes the most convenient to use. The button may have a different size. It is more convenient if it is big. Another important design element is the spindle lock mechanism. 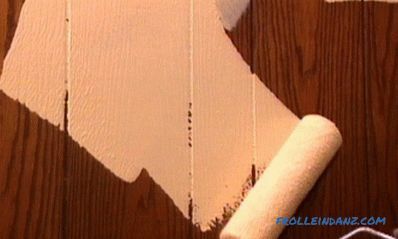 It makes the installation process easier. It is found in most cases exclusively in expensive imported models. It is important to be able to handle the power cord. At first it seems very simple, but if the saw is used outdoors in cold weather, it is best to have the power cord in rubber insulation. This option is preferable to plastic, because rubber is more flexible and its elasticity does not decrease at low temperatures. 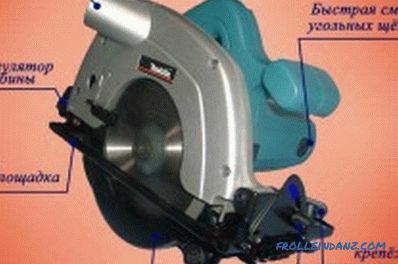 Quite often, modern models of circular saws are equipped with various electronics. 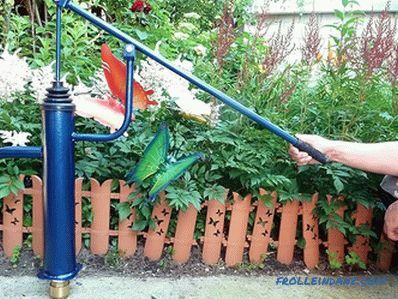 It facilitates the operation of the tool and makes it more convenient. The most common functions such as soft start, overload protection, speed adjustment, maintaining a constant level of speed. What you need to know about saw blades? 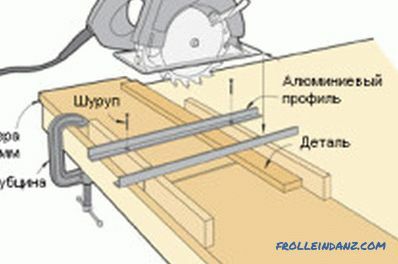 The blades for the circular saw are used different for different materials. One of the most important elements of any circular saw is the saw blade. You need to know that each tool can work with disks of a certain size. It is important to pay attention to such moments as the bore and the diameter of the disc. Safety precludes the use of discs of a larger or smaller diameter than the design of a specific tool requires. This can be done only with the use of special adapters. Type A. These are saw blades with a large number of variable teeth. 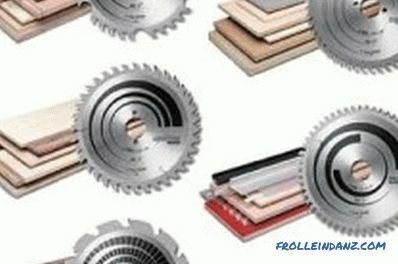 Used for cutting plastic products, chipboard and aluminum alloys. Type B - universal discs. You can cut a variety of wood and materials based on it. Provide high quality kerf. Type C. Discs of this type have fewer teeth than previous blades. Used when working with chipboard and softwood and hardwood. Type D. These canvases have a small number of flat teeth. The cut is pretty rough. Used primarily for fast cutting. Type E. The discs have many teeth. Their main purpose is the thin cutting of soft woods. Type P - the blades have a small number of teeth. Created for rough cutting of soft wood. 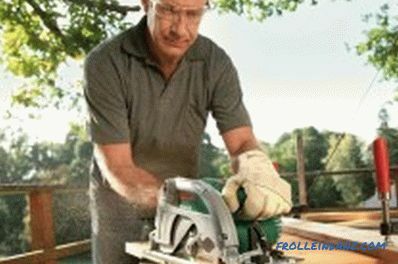 When working with a circular saw, hands and eyes should be protected. Use the saw only with the chip removal system. Be sure to wear a respirator and goggles while working. Clean the workpieces and the tool itself only with a special brush. Control the ratio of the height of the riving knife and the saw blade. The first must be greater than the second by at least 5 mm. Before changing the saw blade, make sure that the tool is turned off. Clean up your workplace regularly. Do not wear too loose clothes. It should not be allowed to fall into a moving mechanism. Do not use the saw to perform tasks that exceed its capabilities. For example, cutting a thick solid log with a cheap amateur saw is not recommended. The workplace should be well lit. In the process, the operator can not be distracted by anything. He must maintain a foothold. If possible, the workpiece should be secured in a vice. It is much safer and more correct than keeping the workpiece in hand. Make sure that the power cord is located as far as possible from the saw blade. Before you start work, make sure that the extension cord is in good condition and the saw cord is intact. The circular saw itself must be dry and clean. Check the condition of the protective cover. Work with damaged and deformed saw blades. Install discs of unsuitable diameter on the instrument. An adapter can be used to compensate for the inner diameter, but the outer diameter must fully correspond to the capabilities of the tool used. Work with materials containing nails, staples and other metal products. Before you start cutting, be sure to remove them. 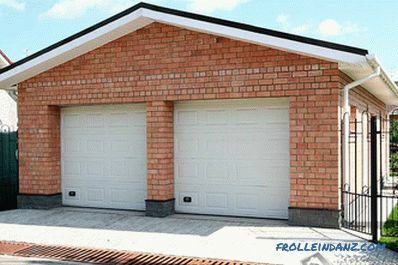 Install a badly ground drive. Use a saw without a protective casing. Start work in poor health. Use the tool when the disc is not positioned correctly (sideways or upwards). Use the tool with the defective start button. Stop the disc by lateral pressure. For repair, it is recommended to contact only certified centers. Subject to these simple rules and recommendations, working with a circular saw will be as safe and efficient as possible. Good luck!